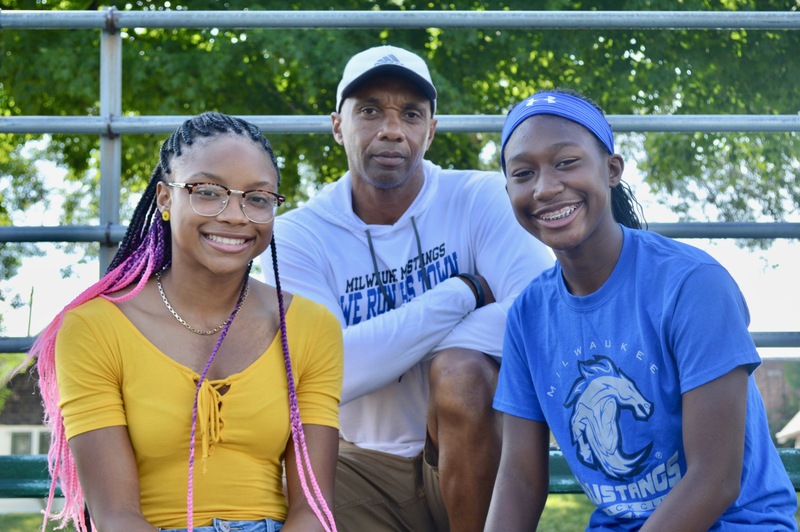 Earlier this month, the Milwaukee Mustang Track Club went down to Iowa to compete in the AAU Junior Olympics Track and Field Championships. The team won 13 medals, the most medals brought home by the Mustangs since the club’s inception in 2002. Head Coach Ray Hale founded the track club in 2000 at the Police Athletic League (PAL) building located at 24th and Burleigh. As a former track runner and coach, Hale enjoyed attending high school meets. However, he noticed a lack of diversity among the runners. So, he gathered a team of runners ages 10 and under, with the idea that he would add older runners as his original team grew up. “I wanted to establish a culture,” he said. Two years later, PAL was sold to the Children’s Outing Association (COA), so Hale decided to strike out on his own. He changed the name from PAL Track Club to the Mustangs. Hale, who grew up in Milwaukee, had run track at South Division High School. After graduation, he coached his old team from 1981 through 1989 and won five state championships. As a runner, he knew how to train his team, whereas some of his volunteer coaches, which included the occasional police officer, did not. Nevertheless, Hale and his team persisted. Currently, his fellow coaches have children on the team, and consequently they know a little more about coaching a track club. “I have a very high parent participation [rate],” he said. Hale described his coaching philosophy as focusing more on the runner’s mental state than on scientific running techniques. He strives to know each kid and works hard to get his team to trust and believe in him. His favorite part is seeing an athlete thrive and transform. “If they believe in you, they believe in themselves,” Hale said. So far, his coaching strategy is paying off, as evidenced not only by the number of medals but by the number of runners. Amari Brown, 16, placed in all her events in Des Moines, with a third-place medal in the 200-meter dash. Brown began running in 8th grade for the Rufus King Middle School track club. Hale attended a meet and asked her to join the Mustangs. Since then, Brown competes with the Mustangs during the summer, trains with the club during fall and winter at the Petit National Ice Center and runs with the Rufus King school team in the spring. Brown and her fellow runner, Jacey Gray-Hall, 14, said that there’s a positive atmosphere among team members. “I feel like it’s the best part of my day,” said Gray-Hall, who will run with Shorewood High School in the spring. She joined the Mustangs after watching her cousin run and decided it looked fun. Running is a stress reliever, Brown and Gray-Hall both said. And the runners are more likely to push themselves harder than their coaches do. Brown explained that if Hale said to be on the starting line in a minute, they’re there in 30 seconds. “Everybody on our team, they [are] there ‘cause they want to be there,” Brown said. Their goal for the team is to make it to the nationals, but they’re each hoping track will help them get into a good college. Hale remarked that participating in clubs such as the Mustangs presents students with an opportunity to attend college and earn scholarships. 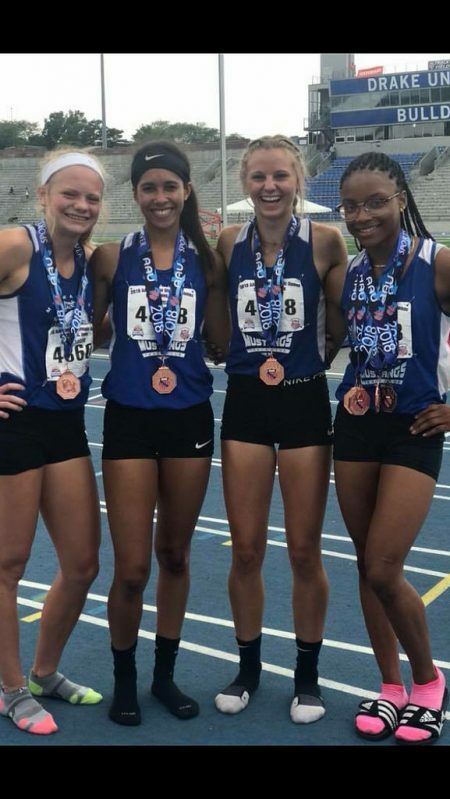 According to Brown and Gray-Hall, some of the best schools for track are the University of Southern California and the University of Kentucky. Although the summer competition season is over, the runners and the coaches are looking forward to training season, which starts in a month. In the meantime, they plan to keep growing the club until everybody knows all about the Mustangs. “And maybe win the Powerball and build our own stadium,” Hale said with a chuckle.